“Related Posts via Taxonomies” is the WordPress plugin. Upload related-posts-via-taxonomies to the /wp-content/plugins/ directory. When you click the ‘Display’ tab, options for display will appear. 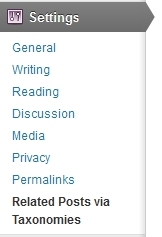 This option automatically displays the related posts list after the content on any single post page. If this option is off, you will need to manually insert display_related_posts_via_taxonomies() into your theme files. When you click the ‘Order’ tab, options for order will appear. When you click the ‘Exclude’ tab, options for exclude will appear. Select checkboxes of any tags you want to exclude. 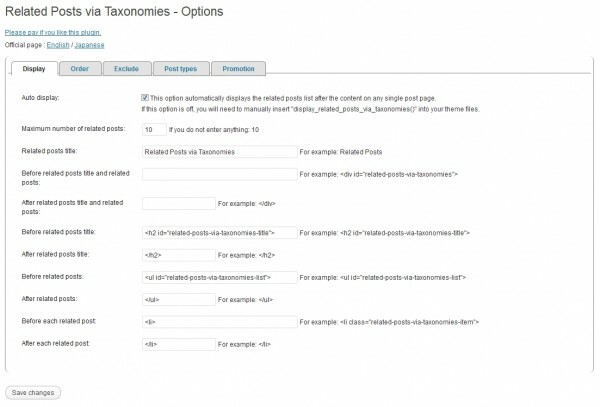 Select checkboxes of any custom taxonomy items you want to exclude. Displays checkboxes of them when there is any custom taxonomy items. When you click the ‘Post types’ tab, options for post types will appear. When you click the ‘Promotion’ tab, options for promotion of this plugin will appear. Could you promote this plugin? If this option is enabled, displays the link to the official page of this plugin after the related posts list. Select a font size of the link text. Select the alignment of the link text. Select from English and Japanese. If the user is not logged in. If the user is logged in. It displays related scores if the user is logged in.